CEDAR RAPIDS, IA – From playwright and critical commentator to leader of the democratic opposition – and eventually a revered statesman, Václav Havel is celebrated as one of the most important figures of the 20th century. In his keynote, Dr. Tomáš Vrba, who worked alongside Havel for the Charter 77 and for Samizdat publishing, will explore the tremendous impact of Havel’s artistic and political contributions from the 1960s – 1990s from a personal perspective. Havel intuitively understood that freedom and democracy need to be defended again and again, and should not be taken for granted. Every simple attempt to forward civil society takes courage–courage to overcome fear and to actively participate in shaping political outcomes. The keynote is the highlight during a full day of programming. The exhibition, Samizdat: The Czech Art of Resistance, will be a central focus of the day’s events. Samizdat: The Czech Art of Resistance explores how seemingly small acts of opposition played a crucial role in resisting the totalitarian regime in Czechoslovakia, which was eventually displaced by the leaders of underground culture—including the first president of Czechoslovakia, Václav Havel. Registration is encouraged. Details and registration at www.NCSML.org/event/ncsml-forum. As part of the worldwide commemoration of Václav Havel’s eightieth birthday, Moderator Kimberly Elman Zarecor, Ph.D., will lead panelists David S. Danaher, Ph.D., author of Reading Václav Havel, and Kieran Williams, Ph.D., author of a forthcoming biography of Václav Havel, in a discussion of Havel’s legacy. Major themes will include democracy and engaged citizenship as well as an approach to reading Havel that highlights this legacy. For Havel, democracy was far more than the periodic opportunity to vote in elections. Democracy was to be performed by citizens who share values that underlie their democratic system and give it strength and unity. This philosophy is one way to reconcile Havel’s various faces – as absurdist playwright, as dissident activist and essayist, and as post-1989 president. The Ongoing Process of Democracy: Insights from East Central Europe and the 2016 U.S. Presidential Election. The Czech and Slovak Republics, along with neighboring Poland and Hungary, have been seen for many years as the post-communist countries that made the most successful transition to democratic rule. Yet recent years have given pause to this assessment. This roundtable uses the panelists’ insights to explore lessons from East Central Europe that might be relevant for evaluating U.S. democracy at a time when the 2016 election has brought forth a dramatically different style of politics and new suggestions of how to achieve effective and accountable government, as well as national unity. Boxed lunches are available for pre-order during the online registration process. Panelists include Krista Hegburg, Ph.D., Program Officer in the University Programs Division of the Jack, Joseph and Morton Mandel Center for Advanced Holocaust Studies at the United States Holocaust Memorial Museum; Owen V. Johnson, Ph.D., Associate Professor Emeritus of Journalism and History at Indiana University; Jonathan Larson, Ph.D., Visiting Assistant Professor of Anthropology at the University of Iowa; Deborah Michaels, Ph.D., Associate Professor of Education at Grinnell College; Tomáš Vrba, Ph.D., currently President of the Board of Directors of the Forum 2000 Foundation and chair of the Board at Theater Archa in Prague. See NCSML.org for detailed speaker biographies. Join us for a tour led by keynote speaker, Dr. Tomáš Vrba. Engage in thematic roundtable conversations facilitated by Czech Studies Workshop scholars and enjoy popcorn from The Great American Popcorn Company. Historical and contemporary topics related to politics will be covered. It is sure to be a lively conversation! The Courage to Take Responsibility: Havel’s Legacy as an Inspiration for Others, Dr. Tomáš Vrba. 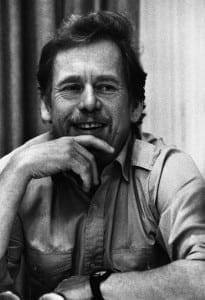 From playwright and critical commentator to leader of the democratic opposition – and eventually a revered statesman, Vaclav Havel is celebrated as one of the most important figures of the 20th century. In his keynote, Dr. Tomáš Vrba, who worked alongside Havel for the Charter 77 and for Samizdat publishing, will explore the tremendous impact of Havel’s artistic and political contributions from the 1960s – 1990s from a personal perspective. Havel intuitively understood that freedom and democracy need to be defended again and again, and should not be taken for granted. Every simple attempt to forward civil society takes courage–courage to overcome fear and to actively participate in shaping political outcomes. Followed by a birthday cake reception (free). “NCSML Forum: Participating in Democracy” is generously sponsored by the Million Dollar Roundtable and Chuck and Mary Ann Peters. All activities are free with admission, unless otherwise marked. Admission is free for members and students. This event is part of NCSML’s Free First Saturdays for Students series, sponsored by United Fire Group, granting free admission to students preschool through college. Additionally, this event is part of Havel@80, a series of events honoring Czech President Václav Havel. More at havel80.cz/. The MDRT Foundation has awarded a $5,000 grant to the National Czech & Slovak Museum & Library to go toward Human Rights Education and programming. Through its global grants, the MDRT Foundation is committed to building stronger families and communities around the globe. This year, the MDRT Foundation will award nearly $1 million in MDRT member-endorsed grants to more than 100 charitable organizations worldwide. Representing the MDRT Foundation, Sylvia Brim (CPA, CFP®, Registered Investment Advisor, Hall of Fame member of the Million Dollar Round Table, and a member of the MDRT Foundation) will present this grant to the National Czech & Slovak Museum & Library on April 2, 2016 at the Forum. The MDRT Foundation was created in 1959 to provide MDRT members with a means to give back to their communities. Since its inception, the Foundation has donated more than $29 million in more than 70 countries throughout the world and in all 50 U.S. states. These funds were raised by MDRT members and industry partners. For more information, visit mdrtfoundation.org . The MDRT Foundation is the philanthropic arm of the Million Dollar Round Table, The Premier Association of Financial Professionals®. MDRT is an international, independent association of nearly 42,000 of the world’s best life insurance and financial services professionals from more than 80 countries and territories. MDRT members demonstrate exceptional product knowledge, strict ethical conduct and outstanding client service. MDRT membership is recognized internationally as the standard of sales excellence in the life insurance and financial services business. For more information, visit mdrt.org.